Hiddush - Israeli couples are voting with their feet! Homepage / Articles and Blogs / Regev Responds / The battle for marriage freedom is getting stronger! The battle for marriage freedom is getting stronger! Israeli couples are voting with their feet! The Ministry of Religious Services has now reported a 4% drop in the number of couples marrying via the Rabbinate from 2016 to 2017. (The decline is really greater, because they ignore the increase in the Jewish population). In Tel Aviv the decline is greater than 15%!! Not surprisingly, they accuse everyone except themselves and the long-standing monopoly that the State granted the Rabbinate over all matters of marriage and divorce of Jews in Israel: "A diminishing number of people believe in the institution of marriage," "They want to circumvent the bureaucratic divorce process," "Western phenomena are penetrating Israel," "They do not want to settle down, regardless of the Rabbinate," etc., etc. What do you think, do these spokespeople really believe what they say and are simply blind to reality, or it all spin intended to shirk responsibility? The irony is that the Rabbinate's monopoly over marriage and divorce is the major threat to the institution of family in Israel. People increasingly prefer to avoid the Rabbinate, which is so alien to the reality of their lives and values, and in many areas (like gender equality) it is antithetical to their convictions. This is not about "the bureaucratic divorce process," but rather a reality in which many Israeli Jews will do whatever it takes not to fall into the hands of the misogynistic rabbinical courts in matters of divorce - and rightly so!! Hiddush surveys clearly show that 4 out of every five secular Jews would prefer not to marry via the Rabbinate. 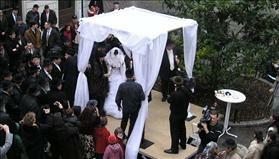 Hiddush surveys clearly show that 4 out of every five secular Jews would prefer not to marry via the Rabbinate. Further, when gauging the level of importance Israelis attach to conflicts over religion & state, the Orthodox rabbinic control over marriage and divorce rates highest.